We’ve been making the most of our bonus day, 29th February, as well as the wonderful weather. We were down to teeshirts today. It seems incredible that only a week ago Chris and I were bundled up against the vicious cold, dragging wood across the firmly frozen lakes. They’re all thawed now and full of life. The fish are stirring again and wild ducks are swooping in from every direction for a paddle. A few cormorants have made an unwelcome reappearance – we hope not for long. 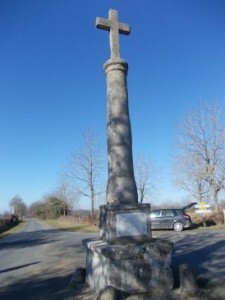 and here is the one near Archignat in Allier. 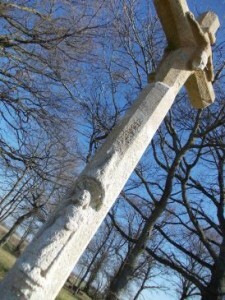 This appears to be much older judging from the amount of erosion that it’s suffered. 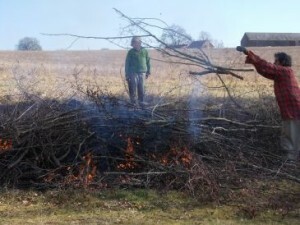 While we have an extra pair of hands around the place in the form of Eldest Son, Benjamin, we moved on to phase two of the branch clearing programme around the lakes – piling up and burning. Actually, we mainly just piled since the wood is still rather wet and the fires we started didn’t last very long. Long enough to take a rather good action pic though! The arrival of leap year lambs would have been the icing on the cake, but our girls are not going to be rushed, that’s for sure. And to finish, a gratuitous pig picture. 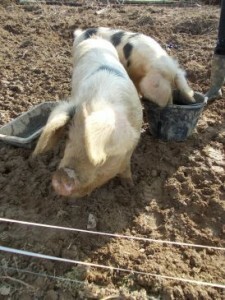 These are some Gloucester Old Spots that belong to friends of ours. Aren’t they great?